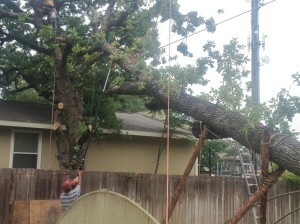 Most sudden tree removals occur during or as a result of storms. Common removal of tree emergencies include: tree falling on house, tree blocking driveway, tree blocking road, and hazardous trees. If you are having a tree emergency right now, we want to take care of you. We recognize seriousness of your situation and will make room for your tree care ahead of routine tree trimming or stump grinding appointments. If there is a major storm and many of your neighbors across San Antonio are in similar dire straights, then the removal of your tree may be sandwiched in between other emergency removals. Please be patient. During storms our crew is poised to jump into removal of tree when the phone rings. Our office phones are forwarded to the cell number of our crew in the field. During emergencies we work long hours and sometimes with two or more competing tree emergencies we will reduce the risk at each site first and then return for wood removal and stump grinding phases. We have chain saws, dump trucks, stump grinders and other equipment we will move to your location as fast as we can. If we can’t provide an exact time, we will communicate with you from the time you call until the time we arrive with calls or text updates as to how close we are. We will reduce your stress level as much as possible and will not abandon you. Call us now and depend on us to take care of you: (210) 441-7071. Removal of Tree where the tree has landed on a structure is a high priority tree removal. San Antonio windstorms, lightening and heavy rains bring trees down. The San Antonio, Texas region is not affected by tornadoes very often, but high winds and widely varying rainfall can take their toll on our Central Texas trees. According to a report produced by our national weather monitor, NOAA, rainfall rates vary from near ten inches to 50 inches from one year to another. The heaviest rains typically fall in May, September, and October, while the driest months, on average are December through March, and July. Precipitation from April through September usually occurs as a result of a thunderstorm, however thunderstorms may occur in any month. Strong winds also come as a result of micro-bursts from thunderstorms. According the the NOAA report, in March of 1994, a storm brought wind gusts up to 104 mph at Randolph AB on the northeast side of San Antonio. Three years later, another storm brought winds of 122 mph at Kelly AFB. Even healthy trees can fail in high winds, but is there anything that can be done to reduce the risk for the trees you own? All trees pose a risk of failure. The level of risk can be managed and removal of tree may be avoided by proper assessment of its root system, soil conditions and slope, exposure to winds, rainfall, and lightening, and tree lean, and other factors. Many potential hazards require the trained eye of Canopy Tree Service arborists. For example, sometimes a tree will grow child branches that are larger than parent branches. The larger child branches may not stay attached. If the tree is located over a sidewalk or area where people, walk, this situation could become grave. A removal of tree may be in order or maybe a trimming. Another example of concern for evaluation by arborists is when a tree has two trunks. Known as codominant stems, these trees are prone to be structurally unstable. Removal of tree may be necessary or bracing may preserve tree, depending on the situation. So are you concerned you may have a tree that is doing OK, and has not been affected by a storm, but wondering about the risk? Does your tree appear to have a fungus? This could lead to the tree being hollowed out and becoming unstable. Does your tree have an insect infection? Perhaps you might see peeling bark. Have you noticed dead limbs way high up in the tree that could fall on a person or car? Are there big tree branches directly over your house? How is the health of the tree? Tall trees in open areas are especially vulnerable to a Central Texas lightening storm. Are there mushrooms growing on your tree roots? Do your trees have roundish circles, “conks” or “fruiting bodies”? Have you noticed carpenter ants or wood boring insects?